Natural gas range installation in the Denver Metro area. 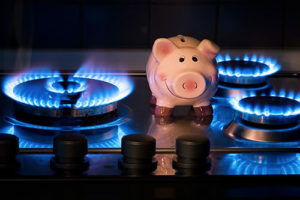 The Gas Connection has been servicing the Denver area for 40 years installing gas lines and natural gas appliances. Our expertise, in all areas of gas line installation and repair, is well known throughout the area. We do not sell appliances but install purchases made from any of our Gold Retail Accounts. Over the years there have been many opinions regarding gas vs electrical application in homes and businesses. Today, there are gas applications for almost anything that requires an energy source. Studies have shown that gas is a clean and economical source of power. There are many advantages to using natural gas in a home or business. Natural gas is more economical than electricity for regular cooking, outdoor grilling and appliances. Hot water heaters, gas logs, fireplaces all run more efficiently. At The Gas Connection, we specialize in residential and commercial gas line installation. We install above and below ground piping, hooking up natural gas products and servicing other devices. As a full service gas contractor, we work with home and business owners, architects and general contractors. Heating, plumbing and mechanical contractors hire us to do their gas work. Today, there are questions as to whether it is better to install a natural gas range or an electric one. It has been found that the natural gas stove has many advantages. For example, when turned on there is an instant flame that is easily adjustable with a turn of a knob. This is compared to an electric stove where there is often a question as to w hether the power is on, off, high, medium or low. The flames of a gas range spread evenly on a pan providing perfect cooking over the entire area. When the cooking is done, turning off the flame is the only requirement. Unfortunately, with an electric stove the pans must immediately be removed from the cooking area. Anyone familiar with a restaurant knows that professional chefs will not prepare food on anything but a gas grill. This allows infinite control of the flame enabling the chef to be in charge of the food at all times. Kitchen staff can now prepare a perfect dish for the eatery’s customers. Currently there are a number of options in gas kitchen appliances. Gas cook-tops are very popular as they can be placed in a free-standing island or installed next to walls. As a rule, they are the same depth of the cabinets which make for easy installation. Gas cook-tops are available with a grill for year round grilling, griddles, deep fryers and wok rings. You can lift out grease wells and other additions that make them perfect for any special occasion. It is also possible to have under-counter models for roasting, baking, grilling or keeping food warm. A free standing natural gas range, on the other hand allows for both on-top cooking or baking. This type of range is also able to present a ‘built-in’ look without requiring any remodel. Many customers comment on how the flames in a natural gas stove spread smoothly. Gas stoves also allow the food to cook faster and more evenly. Do you have questions about a gas line connection, replacement or have a gas appliance to be hooked up? Call us at 303-466-4206 and one of our technicians will be happy to discuss your situation. Proud of our many satisfied customers, we are insured and bonded. We offer free estimates and, of course, provide a warranty on all our work.